Recovering from Ransomware with an Online Backup - Ask Leo! If one should fall victim to hostile file encryption, instantaneous backup to OneDrive presumably would result in those being encrypted too. In other words, if you’re using OneDrive (or Dropbox, or other similar services) to automatically back up files online whenever they change, doesn’t that mean that ransomware would cause those backups to automatically be replaced with their encrypted versions? 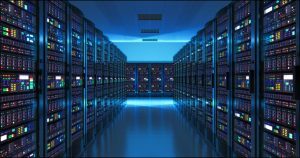 But before you give in to a knee-jerk reaction to avoid online backups completely, consider this: they’ll give you more options, not fewer, should ransomware ever strike. In fact, they could save you in ways other backups might not. Any prior copy of the file is moved to a Recycle Bin on the OneDrive servers. The new copy is uploaded. Yes, OneDrive has a Recycle Bin. This means OneDrive can save your data from ransomware. You use OneDrive to keep a more-or-less continuous backup of your data online. Your machine becomes infected with ransomware of some form, and all your data files are encrypted (and therefore lost to you). If you are online, OneDrive dutifully notices that the files have changed, and backs up the now-encrypted files. You disconnect, clean up, rebuild, or otherwise remove the malware from your machine, but are left with all of your files encrypted. You visit OneDrive online3, and recover your unencrypted files from its Recycle Bin and each file’s version history. You vow to never again do whatever it was that allowed the malware infection to happen in the first place. OneDrive just saved your bacon. What’s more, everything I’ve described above all happens without any other form of backup in place. But of course, you also have other forms of backup — right? A simple, but probably inefficient, means I use is to weekly make a copy within OneDrive of backed up files. This is (almost) exactly what I do myself. Every night I make a copy, elsewhere on my machine, of everything in my OneDrive folder, in the form of a compressed archive (like a “.zip” file). Should I ever succumb to ransomware, I can recover my files from that additional backup. I would not make the copy “within OneDrive”, however, since ransomware could impact that backup copy as well. It would take a lot for even the nastiest ransomware to cause me to lose any significant number of files. You don’t need to be as backup-crazy as I am. You can protect yourself with just a few simple steps. Use OneDrive for nearly continuous backup of your day-to-day working files. Enable File History. File History, though sometimes disabled by more aggressive ransomware, will also let you restore a file to the condition it was in prior to encryption, and can protect files outside of those you keep within OneDrive. Take periodic full, and more frequent incremental, image backups of your entire system to protect from almost any type of failure. Every so often, take one of those full backup images and copy it to offline storage. And, honestly, that last one is just to make people panicking about ransomware encrypting their backups happy. That doesn’t happen so often that I consider it truly critical, particularly with what we’ve just discussed about OneDrive’s Recycle Bin. What concerns me most are folks who say they won’t use online backups because their files might be encrypted by ransomware and the online backup would be useless. Ransomware is only one type of threat. More importantly, it’s not even the most likely threat. For example, a hard disk failure can be much more destructive than ransomware, and is probably much more likely to happen. Even more bluntly: you’re more likely to accidentally overwrite or delete a file than you are to personally encounter ransomware. Even if the Recycle Bin didn’t exist, continuous online backups save your files from many threats that don’t involve invalidating the backup. The same is true for nightly backups to an always-connected external hard drive. Yes, there’s a chance that ransomware could encrypt your backups. There’s a higher probability that you’ll be glad you had those backups current for a variety of other failures. Making backups easy, timely, and automatic is more important than fearing one specific — albeit destructive — form of malware. An Eight-step Back-up Plan Using Windows 10’s Built-in Tools - Eight steps to a backup strategy using Windows own built-in tools, plus four more to handle Microsoft's plans to retire one of those tools. 1: I’ll keep refering only to OneDrive, as it’s baked in to Windows 10, but most of these concepts apply to DropBox as well. Other services may also include similar features, so if you choose to use something other than DropBox or OneDrive, I encourage you to research the options available. The amount of free storage you get is not necessarily the most important factor in deciding which to use. 2: Within 30 days, that is. I’d strongly recommend doing it as soon as you possibly can, just for added safety and reassurance. « Previous post: Just What Is a Backup, Anyway? Leo, I was at a friend’s house one day recently when a ransomware demand popped up on her screen. She had no backups, so we had a few minutes of panic. I was able to unlock the screen and determine that this was, fortunately, fake ransomware. The scare was enough to get her to start backing up her files online. That paid off for her last week when Hurricane Harvey hit. She got flooded and her computer won’t boot (I don’t think it is dead, but I won’t know more until I can get over there and check it out). She was able to locate her backups online and get back to work on another PC. We faced a flooding threat here, too, and I was a little calmer than I might otherwise have been knowing that even if something happened to my laptop, my files would live on. A backup to an external drive is good (and I do that), but a backup that fails due to the same thing that took out your computer is of no use. Thank you for your constant admonitions to back up and to back up your backup! you forgot to mention one drive is only on windows 10. i`m sticking with win 7 ult until the bitter end. anybody else out there doing the same? OneDrive can be installed on Windows 7. It comes pre-installed on Windows 10. I prefer XP myself but 7 is next best. I use a variety of internal and external drives to store files to. My typical script contains about 40 actions. I also use them to keep other machines up to date. I always have complete sets of files in many places, so I will hopefully never lose at least one set. And, I use Macrium Reflect to create images of my C drives in all my machines. This protects against everything, including HD failures, numerous of which I have had in my 30 years of personal computers. Both of these tasks have saved me from a variety of catastrophes. I’ve been backing up since 1989, when I used a magnetic tape device to contain the backup. It stored at the rate of 5 MB per hour. These days backing up and imaging of 50-100 GB takes only minutes. When choosing an external drive for your back up pick one with an on/off switch (Fantom is one brand that has an on/off switch). This makes it easy to turn it on for the back up and then off when done. No unplugging under the desk. Simple and easy. Most online backup programs, such as IDrive and Carbonite, keep multiple historical versions of backed up files, unlike online storage services such as OneDrive, which only keeps a the most recent historical version in its recycle bin. That can be crucial at times. Checking my online Onedrive Recycle Bin it would appear that only deleted files are moved to the ‘online Onedrive Recycle Bin’, not changed files as you advise ? PS. Thanks Leo for all your helpful advise over the years. I just experimented and found that although previous versions of files are not found in the recycle bin, you can go to the OneDrive website and right click on a file, select version history and download previous versions of files. 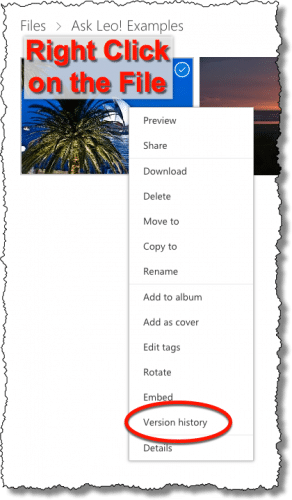 OneDrive for Business allows you to right click on a file and under Properties directly from File Explorer and click on the Previous Versions tab to recover older files. It would help to know how long an online backup or full system image will take. My ISP provides 6Mbs download speed and 1Mbs upload. (That’s megaBIT, not megaBYTE.) Those speeds are not absolute. It all depends on time of day (my ISP throttles back at night to roughly 2Mbs D/L and .5Mbps U/L), and how many people are sharing the bandwidth. Just as a personal example, Windows 10 Pro was a 3.2GB D/L package from Microsoft. It took 14 hours. If my math is correct, it would take more than 5 days for me to upload 60GB to the cloud at my current U/L speed. The cloud may be a viable solution for those who have a fast internet connection. But as for me? I’ll stick to my external hard drives. With my fast internet connection 42 Mb down 8 Mb up, it took me about 2 weeks to download 100 GB of data to OneDrive when restoring my system. Uploading would take probably 5 times longer. That’t why it’s not practical to use the cloud for a full system image backup. Many people I know only have one or two GB of user data. In that case, even a slow DSL should work for data backups. Performing a full image backup online is impractical at today’s connections speeds and disk sizes. Online backups are best for collection of your data files.